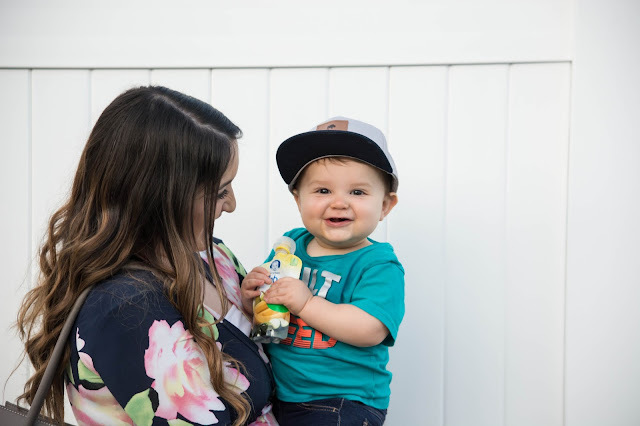 Can you believe mason is almost a year old, there is more demand to this kid I must say but I think its because he's growing up and becoming a more independent toddler. Now these things are bad demands, but fun,happy, cute demands. He demands more attention , lol I need to always keep my eyes on him, he demands if were gone from the house for several hours where we would be away from food at home that I better be prepared for a snack on the go in case he gets hungry. Because this guy can EAT! I've recently discovered for quiet a few months, on to go pouches filled with baby food and thought what a genius thing to do! 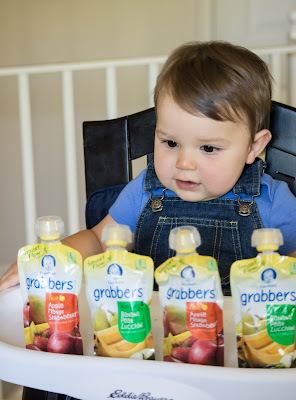 The first one we tried and fell in love with were the Gerber Smart Flow Grabbers! 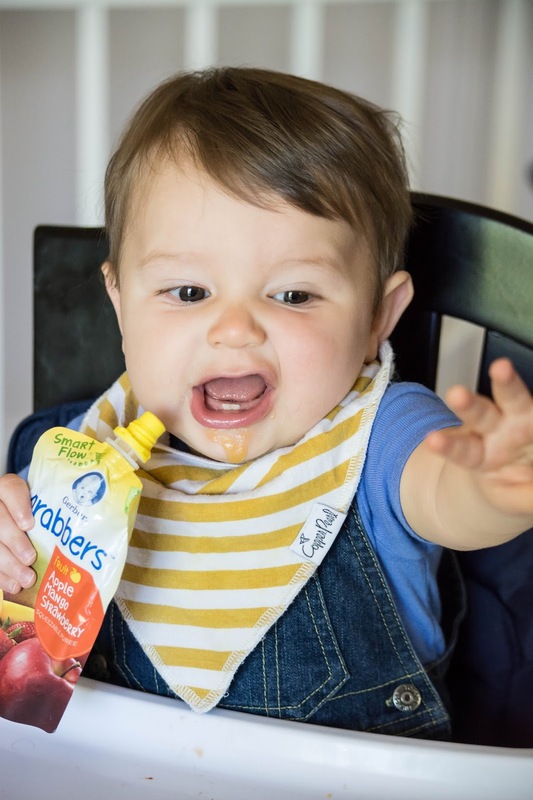 I've loved Gerber for all the things mason has tried rice cereal, baby food, and now that (why not) try there new pouches. We went to our local Smith's Food and Drug store, you can also purchase it at your local Kroger store; and kid you not got like all the flavors available! Right When mason saw them he was very interested it's like he knew there was something delicious in it! 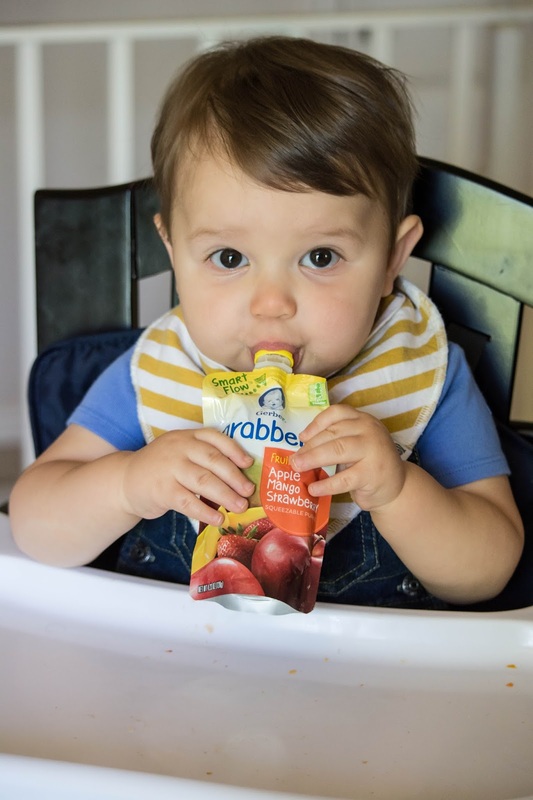 Gerber just came out with there new Smart Flow which has a clear cap, a customized flow, and a molded spout, which means more food in your babies bellies! You don't have to worry about your little one being covered in food because moms lets be honest the less we have to clean up in general, the better and happier we are haha. They have endless of flavors to choose from and the best part is that they are ALL filled with nutritious yumminess! 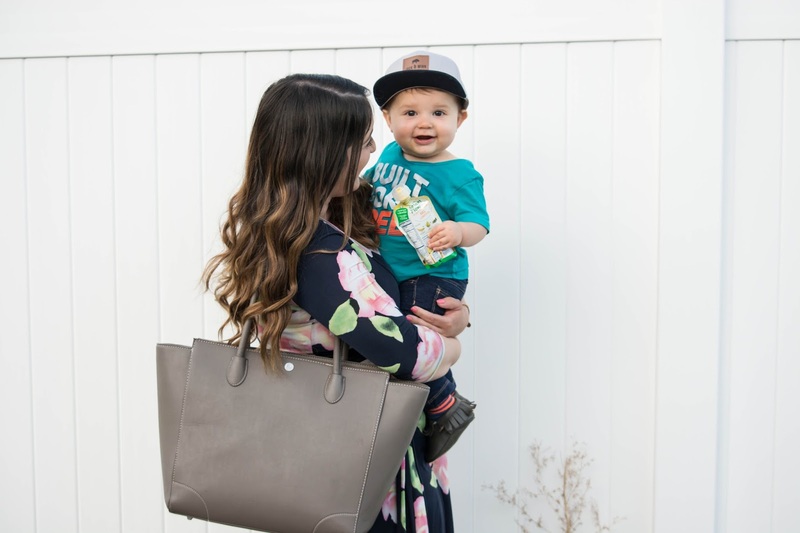 These awesome pouches are perfect when your on the go, seriously I have my diaper bag packed with them and there affordable too so you don't have to worry about it costing a arm or a leg. As you can tell this guy is starting to become more independent and can totally feed himself, I mean I think he prefers it, It's honestly really cute to see your little child do something on his own. I usually put a bib on him when he eats but these truly create no mess! Mason is in love with these and if he wanted or I let him he wouldn't mind eating all of them, like I said he loves eating! This is a definite must for making snack time or on the go time more easier and you can purchase it at Kroger, Ahold, or Smith's Food and Drug. 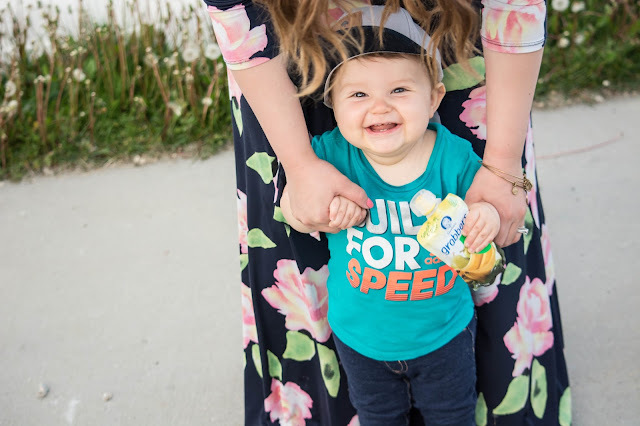 I've also include a Coupon you can use when you buy a Gerber Smart Flow Squeezable! To learn about the product I will attach a link below as well! Let me know if you bought this, how your little one likes it, or what your must have to go item! I love seeing moms' lives made easier with great products :) PS beautiful site! They do look so much easier than we had growing up! These saved me when I had my first baby! Hallelujah! We have had sooooo many #pouchfails. Haha! I will definitely check these out! Your little guy is adorable!! My toddler loves pouches! I'll have to check these out.